Voltaire in 1718. Portrait by Nicolas de Largillière (1656-1746). Voltaire (François-Marie Arouet) (November 21, 1694 – May 30, 1778) was a prolific writer, philosopher, poet and pamphletist, and the preeminent figure of the eighteenth-century French Enlightenment. An acerbic social critic, Voltaire condemned injustice, clerical abuses, prejudice, and fanaticism. He rejected formalized religion, which he saw as superstitious and irrational, although as a deist, he believed in a supreme being. Voltaire emphasized reason, despised democracy as the rule of the mob, and believed that an enlightened monarchy, informed by the counsels of the wise, was best suited to govern. Though Voltaire used the weapon of his wit primarily against corrupt institutions, first and foremost the Church, his attacks also aimed at revealed religion itself. His often considerable cynicism in these matters should nevertheless be seen in the context of the abysmal condition of religious life in eighteenth-century France, particularly among the educated classes. The utilitarian deism promoted by Voltaire, with its emphasis on humanistic virtues, its rejection of dogma, and its ignorance of the inner life, was the almost inevitable response to the prevailing role of the church of his time. His rejection of church authority and conventional morality also enabled Voltaire to maintain a 16-year liaison with a 27-year-old married mother of three children. Voltaire's and other French Enlightenment philosophes' emphasis on reason above feeling would provoke a reaction during the Romantic era in the arts and literature, as well as in religious expression, notably in such theologians as Friedrich Schleiermacher. Yet the humanistic thought of Voltaire would remain an important current in the nineteenth century. Karl Marx, Charles Darwin, Friedrich Nietzsche and other thinkers would promulgate blistering critiques of religion and advance materialist explanations of human origins, history, and the inner life that would form the basis of contentious philosophical, political, and social debate in the modern era. François Marie Arouet, known as Voltaire, was born in Paris as the last child of a wealth notary, François Arouet, and Marie-Marguerite Daumart or D'Aumard. Voltaire's mother died when he was seven years old. At age nine, he was sent to the Jesuit Collège Louis-le-Grand, and remained there until 1711. Though he derided the education he had received, it formed the basis of his considerable knowledge, and probably kindled his lifelong devotion to theater. Voltaire maintained a lasting friendship with some Jesuit fathers. When he graduated and returned home at the age of 17, Voltaire planned to start a career in writing, but his father opposed it. He studied law, at least nominally, and later pretended to work in a Parisian lawyer's office, but began writing libelous poems while getting involved with a high society known for its libertinism. As a result, in 1714 his father sent him to stay for nearly a year in The Hague. Voltaire returned to Paris around the time of the death of Louis XIV. He was soon accused of composing a satire about the Regent and he was sent to the Bastille where he stayed for about a year from 1717 to 1718. There he completed his first play, Oedipe, which was also to be his first success, he began the Henriade and decided to change his name to Voltaire. The most commonly accepted hypothesis is that it is an anagram of the name "Arouet le jeune" or "Arouet l.j.," 'u' being changed to 'v' and 'j' to 'i' according to the ordinary convention. In late 1725, Voltaire was involved in an argument with a nobleman, the Chevalier de Rohan. As a result, he was first sent again to the Bastille based on a secret warrant called a lettre de cachet. In 1726 he chose exile in England instead of imprisonment. The incident left an indelible impression on Voltaire, and from that day onward he became an advocate for judicial reform. While in England Voltaire was attracted to the philosophy of John Locke and ideas of Sir Isaac Newton. He studied England's constitutional monarchy, its religious tolerance, its philosophical rationalism and the natural sciences. Voltaire also greatly admired English religious tolerance and freedom of speech, and saw these as necessary prerequisites for social and political progress. He saw England as a useful model for what he considered to be a backward France. Upon his return to France in 1729 after three years of exile, he spread the substance of his discoveries in his Lettres philosophiques (Philosophical Letters). This work was considered an open attack on the Church and publicly burned. Voltaire himself was safe in the independent duchy of Lorraine where he had begun what was to be a long relationship with Émilie du Châtelet. The marquise du Châtelet was not only his lover but also his close literary and scientific collaborator. In 1735, Voltaire was allowed to return to Paris, which at first he only did occasionally. While continuing a more and more successful career as a writer, he also reverted to the business of courtiership. A combination of both brought success (including a medal from the Pope) as well as trouble, since Voltaire was unable to lastingly control his taste for witty criticism. In 1746 Voltaire, who had been for years acknowledged the first writer in France, was at last elected to the Académie Française. In 1749, Madame du Châtelet died while giving birth to a child that was not Voltaire’s. This death, which deeply disturbed him, was another turning point in Voltaire's life. 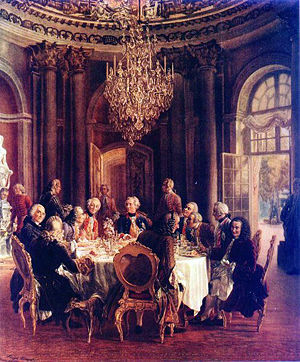 Voltaire (slightly to the left of center) in the court of Frederick II of Prussia, 1750. Painting by Adolph von Menzel, (1815-1905). There, feeling safer, he set up a considerable establishment, which his great wealth made him able to easily afford. He kept open house for visitors; he had printers close at hand in Geneva; he fitted up a private theatre in which he could enjoy what was perhaps the greatest pleasure of his whole life—acting in a play of his own, stage-managed by himself. His residence at Geneva brought him into correspondence (at first quite amicable) with the most famous of its citizens, Jean-Jacques Rousseau. The two men would soon come to hate each other intensely and publicly, Voltaire using his reputation to destroy that of his opponent. Calvinist Geneva’s prohibitions of theatrical performances finally caused Voltaire to abandon the city for nearby Ferney (now called Ferney-Voltaire). At the end of 1758 he bought the considerable property there, about four miles from Geneva, and on French soil. At Ferney, he became a complete country gentleman, and was henceforward known to all Europe as Monsieur de Voltaire, the patriarch of Ferney. His entrepreneurial spirit allowed him to greatly develop the area and to employ more than one thousand people. In his comparatively secure position, he now engaged much more strongly in public controversies. He began a series of interferences on behalf of the oppressed that is an honor to his memory, the most famous being the “Calas affair” where he tried to save a man from unjustified judicial death. A catastrophic earthquake in Lisbon gave Voltaire an opportunity to ridicule the fashionable optimism of the philosopher Gottfried Leibniz (“we live in the best possible world”) in the comic novella Candide (1759), One of the most widely read satires in the Western literature, the book was widely banned because of its scandalous political and religious criticisms and libertine adventures. Voltaire returned to a hero's welcome in Paris at age 83 in time to see his last play, Irene, produced. The excitement of the trip was too much for him and he died in Paris on May 30, 1778. Because of his criticism of the Church, Voltaire was denied burial in church ground. He was finally buried at an abbey in Champagne. In 1791 his remains were moved to a resting place at The Panthéon in Paris, where he lies alongside his nemesis Rousseau. Voltaire was a philosopher in the sense of the French eighteenth-century philosophes, free thinkers in an age where freedom of thought was emerging sufficiently to stimulate challenges to the established order. The philosophes, including Voltaire, Montesquieu, d’Alembert and Diderot, were not philosophers in the technical sense of the word, neither were they academically trained scholars operating in the official institutions of their time. Through their background, many were fortunate enough to enjoy the best education available and their talent allowed them to make full use of it. Their philosophical writings are the forerunners of what today would be called ideology, i.e., the polemical use of ideas to promote a cause, often with little in-depth exploration. Such was the project of the Encyclopédie, to which Voltaire contributed numerous articles. 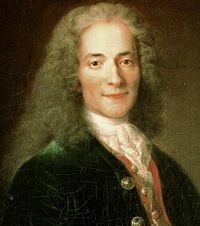 Voltaire is well known for his defense of civil liberties, including freedom of religion and the right to a fair trial. He was an outspoken supporter of social reform despite strict censorship laws in France and harsh penalties for those who broke them. A satirical polemist, he frequently made use of his works to criticize Church dogma and the French institutions of his day. His polemics against the Church could be quite devastating. Though his wit was sharper than any other, Voltaire was, however, far from being the most extreme among the philosophes in his promotion of the new “secular messianism.” He advocated neither atheism (as, for example, Diderot did) nor the overthrow of the regime. The name of Voltaire is synonymous with deism, the rational belief in a God as the great watchmaker and architect of the universe, utterly unrelated to revelation and the dogmas of the Church and Christianity. Finally, Voltaire was typical of the Enlightenment in France in that he not only showed an anti-religious bias, but also displayed a strong tendency towards libertinism and hedonism. On these two points, disciples of the Enlightenment in Germany (Immanuel Kant) and in America (Thomas Jefferson) parted ways with Voltaire and his fellow philosophes. Much of Voltaire’s production expresses the pure enjoyment of the intellectual play with words. Nevertheless, his writings had a considerable effect on the developments that led to the French Revolution shortly after his death. The impact of his ideas was multiplied by the considerable prestige he had gained in old age, a time when he had come to be almost universally admired and revered as a sage and living legend—in ways the young Voltaire would perhaps have scorned. Voltaire was a man of ideas, not a lover of systems, be it for others or for himself. Both in content and in style, Voltaire’s philosophical attitudes were influenced by John Locke and England’s skeptical empiricism. He ridiculed both the religious optimism of Leibniz as well as the humanistic optimism of Rousseau. He greatly contributed to the lessening of Descartes’ influence in France and generally to the elimination of metaphysical concerns. Voltaire’s philosophical ideas and ethical and social criticism tended not to be original, but he generally displayed a keen common sense. The originality of his contribution to philosophy was his genius at translating and spreading others’ ideas and forming a front of irresistible power. Voltaire believed in progress and in the virtues of civilization, contrary to Rousseau’s belief that civilization corrupts man. However, his faith in culture was measured and he did not expect the coming of any golden age. Throughout his life, Voltaire fought for religious liberty. He discovered its virtues early on in his life, during his stay in England. In his Philosophical Letters (Letter 6, “On the Church in England”), Voltaire said, “If there were only one religion in England there would be danger of despotism; if there were two they would cut each other’s throats. But there are thirty, and they live in peace and happiness.” Later, he would fight with a vengeance to right the wrongs perpetrated against Protestants, whose beliefs he was far from sharing. This passion came together with an equally strong dislike of the institutions of the Catholic Church and its abuses. In spite of an occasional positive interaction and mutual respect in isolated situations, Voltaire found himself in a lifelong battle against the Church. He was also distrustful of religious enthusiasm and the emphasis on human sin (Blaise Pascal), both of which in his eyes represented the danger of fanaticism. Voltaire’s position towards religion per se oscillated between prudent approval and violent opposition, complete with incisive verbal abuse. Voltaire is known to have recommended that religion be maintained for the people as a deterrent and an encouragement toward the good life. He is famous for saying “Si Dieu n'existait pas, il faudrait l'inventer” (If God did not exist, it would be necessary to invent him). There was, however, more than mere cynicism in his position. Voltaire’s viewpoint is best summarized in the article entitled “theist” of his Philosophical Dictionary ("theist" stands for "deist" in Voltaire’s terminology). The theist, Voltaire states, is deeply convinced of the existence of a supreme being “as good as He is powerful,” just without cruelty and kind in his rewards. He makes no claim to any knowledge about this God, his motives and his ways, and rebukes those who do. The theist’s religion is that of a universal brotherhood, that of helping the needy and defending the oppressed. Voltaire's works, and especially his private letters, constantly contain the word l'infâme and the expression écrasez l'infâme (crush the infamy). This expression clearly refers to religious abuse and oppression, not to Christ or the Church. However, Voltaire’s opinion about revealed religion, Christianity in particular, was negative. For him, dogma and specific beliefs were an obstacle, rather than an aid. He considered the Jewish people to be a small desert nation without a culture that had unduly undermined the achievements of much greater civilizations. He was equally unkind to the content of the Gospels. In spite of his aristocratic pretension, Voltaire was a son of the bourgeoisie and he embodied that class’s spirit of entrepreneurship. His stays in England, Holland, and later Geneva certainly contributed to love for free enterprise. He had always had a keen sense for business and became wealthy early on, in ways that were not always to be recommended. Towards the end of his life, in Ferney, he had become a large-scale industrialist. He had actually created a sizeable community around his own estates, thus accomplishing what future social utopists would often try in vain to achieve. These accomplishments fit well with Voltaire’s agnosticism and muted pessimism in religious matters. His famous Candide concludes with the statement that one has to “cultivate one’s garden” instead of pursuing impossible metaphysical dreams. In Ferney, Voltaire had the opportunity to do just that, quite literally. Voltaire perceived the French bourgeoisie to be too small and ineffective; the aristocracy to be parasitic and corrupt; the commoners as ignorant and superstitious, and the church as a static force only useful as a counterbalance since its "religious tax," or the tithe, helped to cement a powerbase against the monarchy. Voltaire distrusted democracy, which he saw as propagating the "idiocy of the masses". To Voltaire only an enlightened monarch, advised by philosophers like himself, could bring about change as it was in the king's rational interest to improve the power and wealth of France in the world. Voltaire is quoted as saying that he “would rather obey one lion, than two hundred rats of [his own] species.” Voltaire essentially believed monarchy to be the key to progress and change. Voltaire was a prolific writer and produced works in almost every literary form, authoring plays, poetry, novels, essays, historical, philosophical and scientific works, pamphlets, and over 20,000 letters. Voltaire made significant contributions to social studies and history with works like The Century of Louis XIV, Charles XII (1731), which rejected the proposition of a divine providence in history, and the “Essay sur les Moeurs.” His Philosophical Letters (1734), written after his return to France after some years in England, compared the French and English systems of government, to the discredit of his native France. His satirical and subversive Philosophical Dictionary (1764) argued that the religion should teach little dogma but much morality. In his time, Voltaire became famous for what later generations would consider to be the wrong reasons: his tragedies and epic poems. These productions, admired by Voltaire’s contemporaries, are now considered technically well done but conventional and devoid of creativity. They hint to one of Voltaire’s lesser traits of character, his vain desire for admiration, while the real Voltaire spontaneously appears in the less formal setting of his “contes” (tales) and letters. Voltaire's tales are unquestionably the most remarkable fruit of his genius. They were usually composed as pamphlets, with a purpose of polemic in religion, politics, and “idées reçues” (idea that are generally and uncritically accepted). In works such as Candide, L'Homme aux quarante écus, Zadig and others that puncture received forms of moral and metaphysical orthodoxy, the peculiar quality of Voltaire—ironic style without exaggeration—appears. Candide is the most widely read of Voltaire's many works and his only work which has remained popular up to the present day. The novella begins with a young man, Candide, who is living a sheltered life and being indoctrinated with Leibnizian optimism by his tutor, Pangloss. The work describes Candide's slow, painful disillusionment as he witnesses and experiences great hardships in the world. Candide is known for its sarcastic tone and its erratic, fantastical, and fast-moving plot. With a story similar to that of a more serious bildungsroman or picaresque novel, it parodies many adventure and romance clichés. Voltaire ridicules religion, theologians, governments, armies, philosophies, and philosophers, most conspicuously Leibniz and his optimism. As expected by Voltaire, Candide enjoyed both great success and great scandal. Immediately after its secretive publication, the book was widely banned because it contained religious blasphemy and political sedition hidden under a thin veil of naïveté. Today, Candide is recognized as Voltaire's magnum opus and included as part of the Western canon. Voltaire’s vast correspondence is constantly being augmented by fresh discoveries, much of it remaining unpublished. In this collection of letters, Voltaire's personality is best shown. His immense energy and versatility, his adroit and unhesitating flattery when he chose to flatter, his ruthless sarcasm when he chose to be sarcastic, his rather unscrupulous business faculty, his determination to anything necessary to escape his enemies—all these things appear throughout the whole mass of letters. Voltaire’s lasting friendship with a few individuals also appears through his informal exchange with them, much of which is filled with spicy remarks. Voltaire's legacy has been immense. Voltaire envisioned a secular, tolerant society and emphasized progress through scientific advances and social and political reform, and through transcending the confines of religious dogma and superstition. The influence of these Enlightenment ideals would survive the reaction of the Romantic era and, following the Industrial Revolution, emerge in the twentieth century in a renewed rationalist challenge to the truth claims of revealed religion. Voltaire's emphasis on reason and justice, his icy wit, and his formidable gifts as a satirist and polemicist influenced such Enlightenment figures as Benjamin Franklin and Thomas Jefferson. His affirmation of civil rights and the principle of religious freedom would find expression in the U.S. Constitution and its guarantees of freedoms of speech, the press, and religion. In France, Voltaire's fiery condemnation of the corruption of the church bore fruit in the radicalism and violence of the French Revolution in 1789. Anti-clerical violence and appropriation of church lands would undermine the church and the role of religion in French life. Voltaire has cast a shadow over much of Europe to the present day in the marginalizing of Christianity and secularism of European society. "Le mieux est l'ennemi du bien." Translation: "The best is the enemy of the good." (Dictionnaire Philosophique). "If God did not exist, it would be necessary to invent him." (Epistle on the "Three Imposters"). This statement by Voltaire became so familiar that Gustave Flaubert included it in his Dictionnaire des idées reçues ("Dictionary of commonplace ideas"), and it is still among the most frequently quoted of Voltaire's dicta . I do not agree with a word you say but will defend to the death your right to say it. It was actually first used by Evelyn Beatrice Hall, writing under the pseudonym of Stephen G. Tallentyre in The Friends of Voltaire (1906), as a summation of Voltaire's attitude, based on statements in Essay on Tolerance where he asserts: "Think for yourselves and let others enjoy the privilege to do so too." Voltaire's Story of the Good Brahmin philosophicalsociety.com. This page was last modified on 25 January 2016, at 17:39.